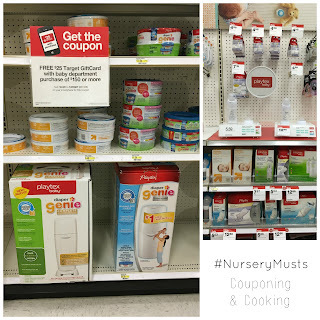 When I found I was pregnant last year, I could not wait to start my baby registry. As someone who had not so secretly been stalking the baby section at Target for years, I knew that I would be registering there. Not only do they have all the essentials but they also have some of the cutest bedding, clothes and accessories around. The registry and our unbelievably thoughtful family and friends helped us get exactly what we needed to set up Easton's nursery. 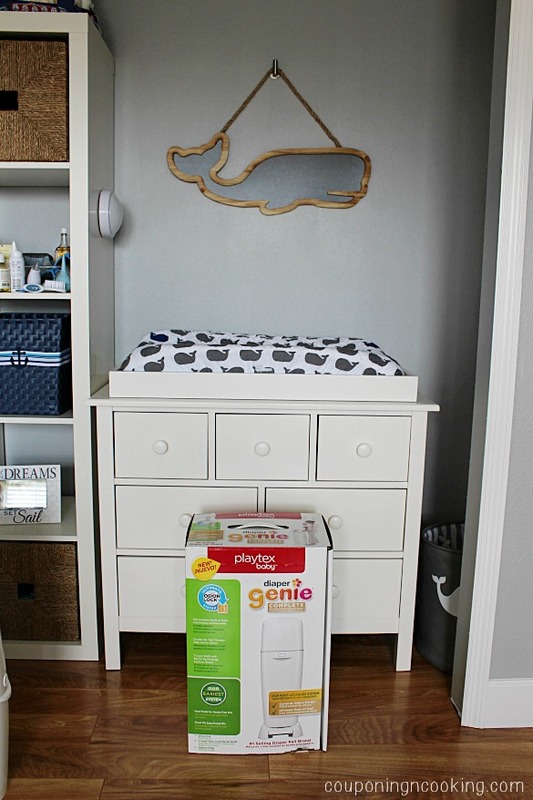 Setting up the nursery can be one of the most exciting and simultaneously overwhelming parts of getting ready for a baby. 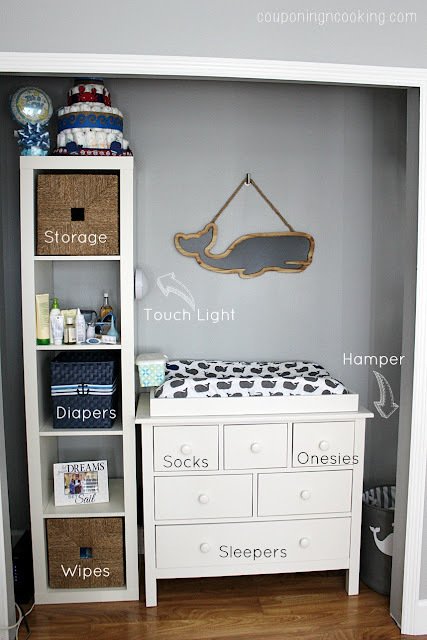 If you are anything like me you probably did a lot of googling and pinteresting in planning your baby's new room. I had so many grand ideas that I wanted to use but given our space and budget restraints I ended up adapting my visions to fit our home. We converted our old office into Easton's nursery and while its many windows allow for tons of light they also mean that we are short on wall space. This meant that we had to get creative to make space for our changing table area. 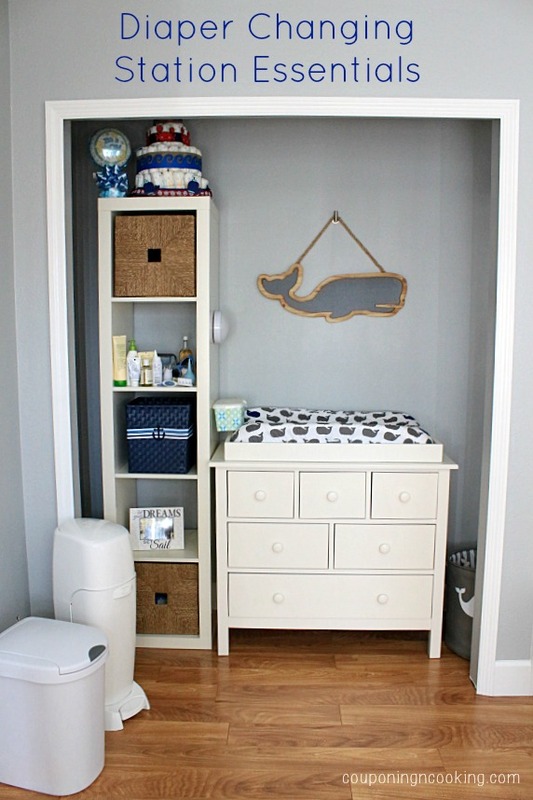 By taking the doors off of one side of the nursery closet we were able to do just that. Alongside our changing table, I wanted an area where I could keep all of baby's diapering must haves in arm's reach as well as to provide for some storage. We used a five cube storage shelf next to the table and I added some baskets for storage. I had visions of my tiny baby laying peacefully while I changed his diaper in a perfectly organized changing station. And for the first few months of his life, that dream actually came true. The second Easton turned three months old he suddenly figured out that he had the ability to move around on his changing table. It started with sumo stopping his feet every time we tried to change his diaper and has now progressed to reaching behind his head and pulling wipes out of the container and putting them in his mouth. While I have never and would never leave him unattended on the changing table, his new found mobility means I have to be more vigilant than ever and that has lead to some reorganizing of our changing area. Diapers and wipes- lots of them. Originally I stored all of Easton's extra diapers and wipes in his bathroom closet. A few poorly timed blow outs with low supplies means I now keep everything within arms reach of his changing tables. Both my diapers and wipes are stored in baskets that I can access with one hand so I can keep the other on Easton. A Diaper Genie Complete- I originally registered for and got the Diaper Genie Essentials which was great at first. However, I fell in love with the Complete version at a friends house a few weeks ago and I am loving the bigger size, the foot pedal open and the fact that it holds up to 270 diapers before needed to be emptied. Baby personal care items- I use a clear plastic tray to organize all of Easton's personal items. We try to keep his lotions, diaper creams, hair brush, thermometer, nose bulbs, and other items all in one places so that we aren't scrambling looking for them. Having all of it right next to me when I change him makes it much easier. Touch Light- We bought this at Target right after Easton was born and it is perfect for adding a little light in the middle of the night without turning on the bright overhead light. It was so easy to stick right on the shelf too. 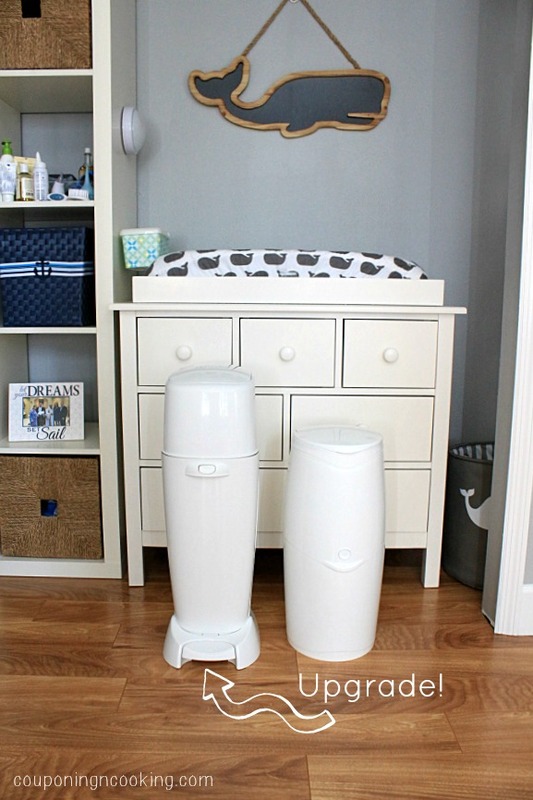 A strategically placed laundry hamper- I love having the hamper right next to the changing table so I can just drop his dirty outfits right in without having to take a step. 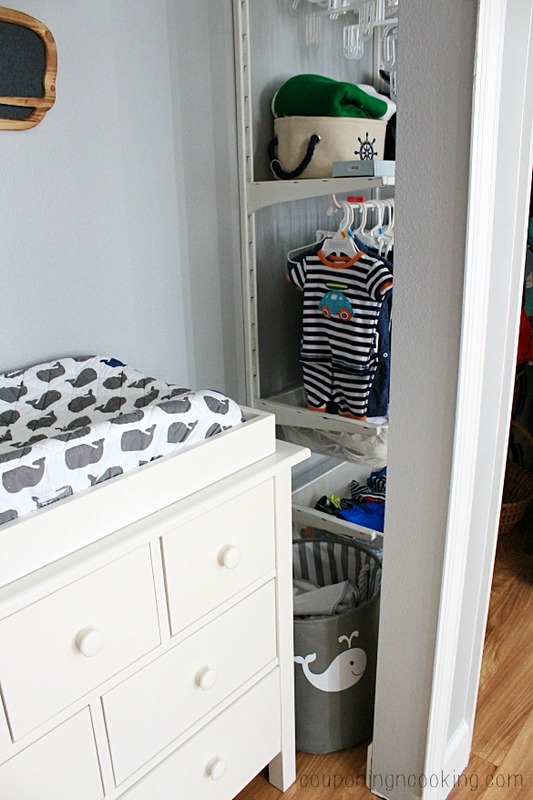 Easy access to baby's clothes- Along with keeping all his onesies, sleepers and socks in the changing table drawers, our closet set up allows me to hang his outfit for the day right within arms reach so I can just grab it off the hanger while standing in front of the changing table. 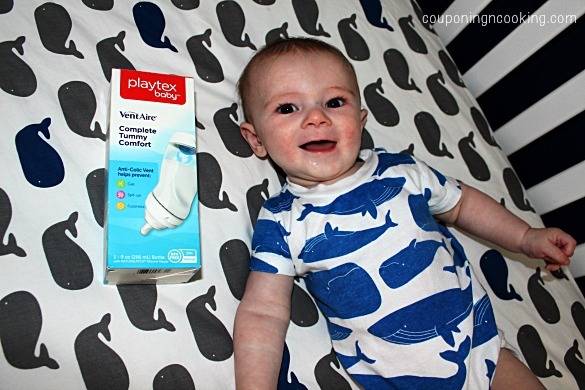 While I was shopping in Target for the new Diaper Genie I also picked up a Playtex VentAire bottle to try too. Now that I am back to work full time we are starting to supplement with formula and I am looking to find the right bottle for Easton. I am excited to see how he likes the angled design and anti-colic vent. He had colic and gas issues as a newborn so hopefully these features will help his tummy. Moms, what are your nursery must haves?